SALARY: The contract is for a maximum of 75 days over 8 months (c.9 days per month). The daily rate is £100 per day, up to a total contract fee of £7,500. CONTRACT TYPE: Part-time and temporary. This is a freelance, self-employed post and the Researcher will be responsible for their tax, NI contributions and public liability insurance. We seek a Sculpture Collection Researcher to undertake an extensive, detailed survey to determine the nature and extent of public sculpture collections and sculpture in the public realm in the UK during the Development Phase of a Heritage Lottery Fund project, Your Sculpture, working towards a second-round Delivery Phase application. The PCF are seeking to employ a Sculpture Collection Researcher to research the location of sculpture collections in public ownership throughout the UK. The successful candidate will contact and liaise with selected institutions in the UK and gather set information about their sculpture collections and other sculpture-related holdings, e.g. films, audio recordings. They will also need to research the location of public monuments and sculpture in selected areas of the UK, in liaison with the Public Monuments and Sculpture Association. All gathered data will need to be collated and the results presented in an agreed format. Full details of the Your Sculpture project will be provided and the candidate will be required to undertake training and review sessions, as required. PCF are seeking a candidate with a proven attention to detail. The successful candidate will be a point of contact for art collections about the sculpture they hold and so must have strong proven communications skills, both verbal and written. An interest in art and awareness of UK art collections is essential. HOW TO APPLY: Please send a CV and covering letter to Katey Goodwin, Project Manager, at katey.goodwin@thepcf.org.uk with ‘Sculpture Collection Researcher’ as the subject. Interviews will be held on Thursday 19 February 2015 at PCF Head Office, 33 Maiden Lane, Covent Garden, London WC2E 7JS. It is hoped that the successful applicant will commence the role in March 2015 and complete the work in October 2015. If you have not heard from us by 12 February, please assume that you have not been successful. Unfortunately, we do not have the resources to contact every candidate individually. The charitable mission of the Public Catalogue Foundation (PCF) is to transform access to the UK’s publicly owned art, much of which is not on display, for enjoyment, learning and research. Its priorities lie in mapping art collections, encouraging public engagement with them and improving our knowledge of these collections. Your Paintings is the PCF’s flagship website showing the nation’s entire oil painting collection in public ownership, photographed by the PCF over a ten year period. Working closely with collections up and down the country, PCF completed the digitisation programme in late 2012, by which point it had recorded over 210,000 paintings from over 3,000 collection venues. The website www.bbc.co.uk/yourpaintings was built in partnership with the BBC. Future plans for the PCF involve replacing Your Paintings with Your Art, a new and improved version of the website, which will constitute a unique and powerful digital showcase of art in the UK for audiences across the world, and feature the UK collection of sculpture alongside the paintings already shown. The PCF is a registered charity with number 1096185. The PCF has chosen sculpture to be the focus of its next major digitisation programme. As with oil paintings, we estimate that approximately 80% of publicly owned sculpture remains out of sight or inaccessible to the public. Creating public access to this hidden heritage will enable anyone with Internet access to uncover the hidden treasures and stories behind the UK’s sculptural heritage. Your Sculpture will cover sculpture of the last 1,000 years, created within and outside the UK, including non-European sculptural objects. We will be working in partnership with the Public Monuments and Sculpture Association (PMSA), who photograph and catalogue outdoor sculpture across the UK. The PCF has received initial support of £2.84m, including a development of £109,700, from the Heritage Lottery Fund (HLF) for the Your Sculpture project. The Development Phase of the Your Sculpture project will run throughout 2015, in advance of a second-round application to HLF. If this application is successful, the Your Sculpture project Delivery Phase will commence in 2016. At the very far end of platform two at Stoke-on-Trent railway station sits a sculpture that has intrigued me for many years. It will have been glimpsed by thousands of passengers from the windows of trains leaving or arriving into Stoke, but I doubt that many will have seen it up close. 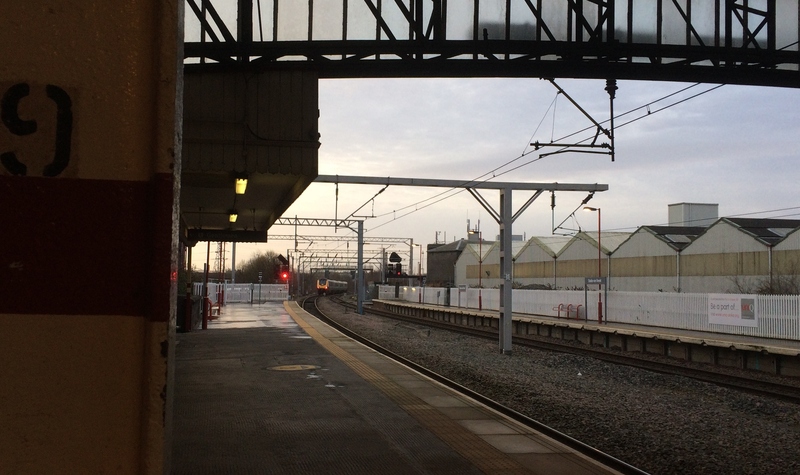 It’s sited so far down the platform that unless you are getting out of Coach K of a Virgin Pendolino from London to Manchester (the only coach that stops in that part of the station) you would never have any reason to walk past it. Yesterday, I finally made the effort to take a closer look, wondering if I would be stopped by a member of the station staff thinking I was going to throw myself off the end of the platform. There is nothing by the work to tell you what it is, but a bit of research on the Public Monuments and Sculpture Association’s National Recording Project database tells us that it is Hand with Chronos by Vincent Woropay (1951-2002). Their entry states that it was commissioned by British Rail and unveiled in 1988. 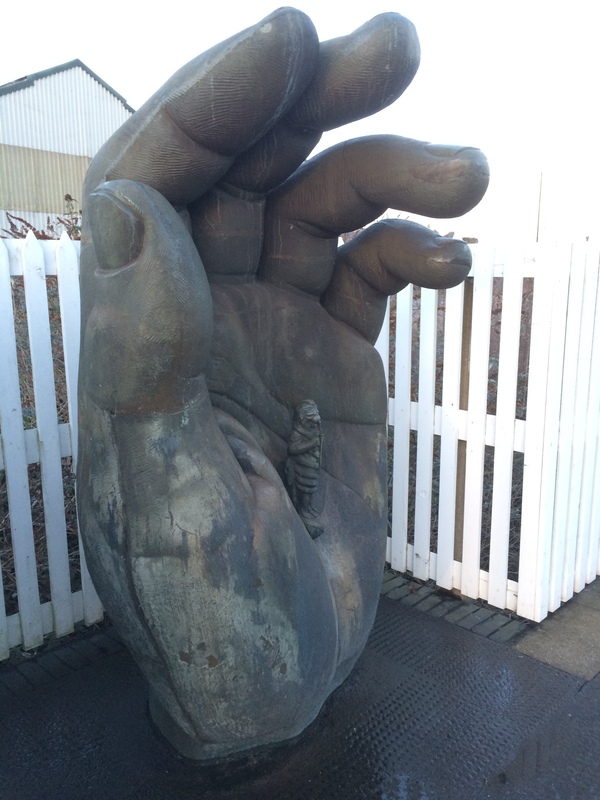 Other sources, however, including the online Stoke Sculpture Trail, say that it was originally commissioned for the National Garden Festival at Gateshead in 1990 and then later moved to Stoke Station. Up close, the detail on the fingers of this oversized hand can be seen, as well as the small figure resting in its palm. The figure, a chronos, has the head of a lion, a snake wrapped around his body and a pair of small wings sprouting from his hips. 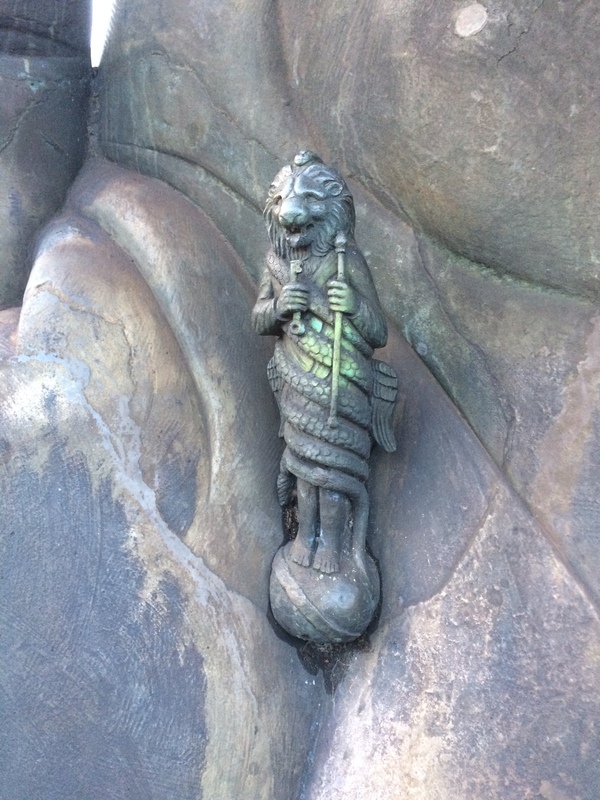 He holds a staff and a key. The PMSA database entry gives a full description of the meaning behind this small figure on the oversized hand, relating it to the personification of time, and a failure to look forward or back and just be stuck in the present. Woropay was born of Polish parents in London, moving with his family to Los Angeles in 1964. He returned to London to complete his schooling at the Salesian College, Battersea, before studying sculpture at Brighton Polytechnic (1974-1977) and the Slade School of Fine Art, London (1977-1979). Another Woropay sculpture can be seen in Stoke-on-Trent – a colossal head of Josiah Wedgwood, made for the 1986 Stoke Garden Festival, which is now sited near Wedgwood’s former home, Etruria Hall. It’s a shame that so few people get to see this sculpture, except for fleeting glimpses as they race past. It would be good to see it moved to a more visible location. The good news is that the Heritage Lottery Fund have given us permission to start the Development Phase of the Your Sculpture project. During this phase, which should take us around 12 months, we have to undertake further research into the scope of the project, how it will be run and managed, and how we can bring the UK’s sculpture heritage to the widest possible audience. By the end of the year we will have produced a number of documents including an Activity Plan, a Business Plan and a Management and Maintenance Plan, and we will have completed a second-round HLF application. Twelve months seems a long time, but we have a lot to do! The next few weeks are going to see a flurry of activity – setting up the project management team, recruiting project staff and engaging consultants to help us develop our plans. The consultants will help us with a wide variety of project areas, including management of a large team of volunteers, production of films and development of the Your Sculpture website. We’ll also be developing ideas to diversify our audience and how to engage with people both on-line and in person. Although this project is about people and connecting them to their sculpture heritage, we musn’t forget the sculptures themselves. A key part of the development phase will be further research into the nature and extent of sculpture in UK public collections and outside in the public realm. We have estimated how many works are out there, but further investigation will tell us if our estimates are accurate. Posted on January 13, 2015 January 14, 2015 8 Comments on Permission to Start!